Sarah Nader- snader@shawmedia.com Stylist Beckie justice (left) of Lake Geneva takes care of her client, Anita Myers of McHenry while working at Hair Ink Salon in McHenry Thursday, Nov. 17, 2016. Gov. Bruce Rauner signed a law that will go into effect in Illinois next year that will require hairdressers to be trained to identify signs of domestic abuse. 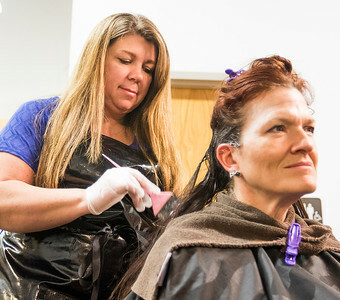 Salon workers will take a one-hours class every two years when they renew their licenses to learn how to spot red flags on the job. 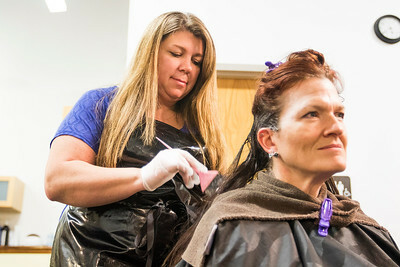 Stylist Beckie justice (left) of Lake Geneva takes care of her client, Anita Myers of McHenry while working at Hair Ink Salon in McHenry Thursday, Nov. 17, 2016. Gov. Bruce Rauner signed a law that will go into effect in Illinois next year that will require hairdressers to be trained to identify signs of domestic abuse. 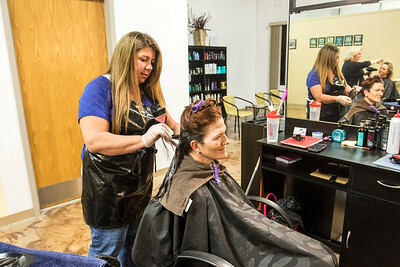 Salon workers will take a one-hours class every two years when they renew their licenses to learn how to spot red flags on the job.